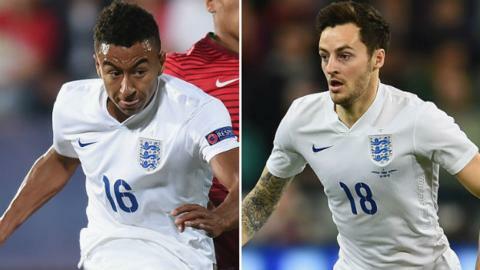 Manchester United forward Jesse Lingard and Tottenham midfielder Ryan Mason have been called into England's squad to face France on Tuesday. Lingard, 22, has made 11 appearances for England Under-21s but this is his first time with the senior squad. Mason, 24, has not started a league match since returning from a knee injury picked up in September. His only senior cap was against Italy in March. United's Michael Carrick and Leicester striker Jamie Vardy are both out. Manchester City's Fabian Delph was the only absentee from training on Monday, in which there was a minute's silence for victims of the Paris attacks. Lingard made his debut at under-21 level as a substitute against Scotland in August 2013, when senior boss Roy Hodgson took charge of the team. Having come through United's academy, he has played seven times for the first team, and had loan spells at Leicester, Birmingham, Brighton and Derby. He scored his first goal for the Red Devils in the 2-0 victory against West Bromwich Albion on 7 November. Mason, who was forced to withdraw from an England squad in June through injury, links up with fellow Spurs midfielders Eric Dier and Dele Alli in the squad.